If you read my 'Places I Want To Travel' post then you would have seen that personal posts are one of my favorite things to read on blogs. I love to know more about the person behind the blog instead of just what beauty products they enjoy. I find its good to know someone is passionate enough about a blog to let their readers know a bit more about themselves. For this reasons I thought I would do this tag. I wasn't actually tagged to do this but there are no rules of blogging so I thought I would do it anyway. Well my full name is Fleur Danielle Cecilia Griffin. My first and last names were not after anyone. However 'Danielle' was after my Grandad who was called Daniel. Being a girl obviously they were not going to call me Daniel so they chose the female alternative. Cecelia is actually my confirmation name but I chose to be named that after one of my Great Aunts. I cry quite a lot. I am a very emotional and sensitive person so the tiniest thing can get me going. However the last time I cried was a couple of nights ago when a friend suggested I watch the Hilary Duff film 'Raise Your Voice'. It was definitely not a film I expected to be that emotional but I cried loads during it! If you haven't watched it please watch it! Nope not at the moment. I hope to sometime in the future though. I can actually be quite a difficult person to get on with. I can be quite negative and shy and I don't let people in that easily so I'd get easily put off by it. However saying that I probably would be due to having quite a few things in common. Only in a jokey manner. I definitely do not use it to purposely hurt somebody because that is just a big no-no in my eyes. Also if you are going through a lot and someone is like 'yeah yeah yeah and say things when in actual fact they do not actually care then that is something I actually hate and cannot stand with people. I am someone who is easily scared and afraid by things like this, however saying that if it was for charity then I definitely would do it. I have faced a couple of my fears in the past and it definitely is one of the best feelings ever, so yeah I definitely would sometime in the future. I absolutely love Curiously Cinnamon. It is just so good and tastes nice on its on and makes a good snack throughout the day as well. They also have a strawberry flavor one now that is just as nice. If observing from afar then their appearance but I am not a judgemental person. However if I am speaking to someone for the first time then normally their manner and ways of speaking. An aggressive speaker puts me off right away. Dark brown. However I wish I had blue eyes. I am seriously attracted and jealous of people who have blue eyes. Happy Endings by far. I am way to much of a wimp to sit through an entire scary films and if I do then I am biting my nails and fidgeting the whole way through. Definitely not my thing. I love sweet and fruity smells. Vanilla scent is one of my favorites and also the sugar crush smell from Soap and Glory. However I also love certain fresh scents too like freshly cut grass and the fresh air smells too. My personal preference is definitely sweet and fruity smells. To be honest I definitely prefer the winter season. I love wrapping up in front of the TV with a mug of hot chocolate in the evenings and warm bubble baths. Winter also means Christmas! Instant winner for me right here. However I do love summer too. The sun makes everyone a lot more happy and jolly. BBQ smells that fill the air during the summer time too are just heavenly but I don't really adapt to the heat so I definitely prefer Winter. Definitely the computer. You can blog, tweet, go on facebook and watch nearly every TV show and movie that ever existed online. One of the best inventions ever. Probably going to Mauritius twice when I was younger. However in the future I definitely hope to go to Australia which is further away than Mauritius so that will soon overtake Mauritius as the furthest I've been from home. I can play the violin quite well but other than that no not really. I am going to be taking up a few acting classes in the Autumn though so we will soon see if I have a talent in that field. Blogging, shopping, baking are my main three now. However I am going to be learning the guitar over the summer as well so that will be another hobby to add to the list. Unfortunately not but I would love to own a little dog or a cat sometime in the future. We always said we would get a fish tank when I was younger but it never happened. No idea why. Oh I have loads. A Walk To Remember, The Notebook, Breakfast at Tiffany's, Tangled, The Sound of Music, Grease, Never Been Kissed, Ever After, The Princess Diaries 1 & 2 etc. I love really girly and the cliched 'chick flick' films. I also love films like Stand By Me, Toy Story, Philadelphia and obviously all the Harry Potter and Lord of the Rings movies. I could literally go on forever for this question but I think I'll stop there. Yes I have 1 brother and 2 step brothers. 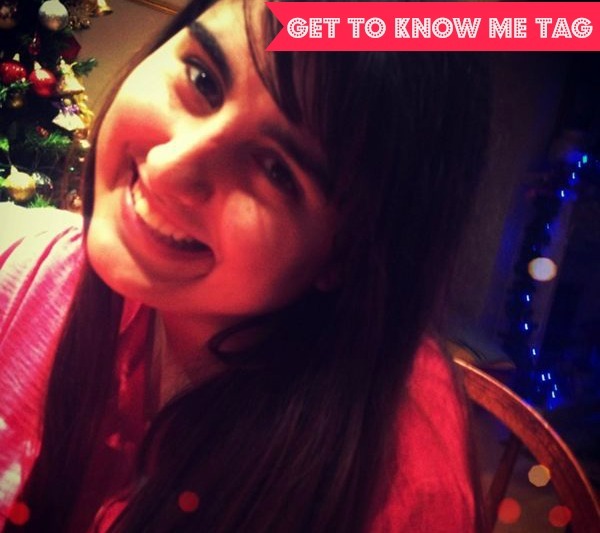 I hope you have enjoyed reading this post and getting to know a little bit more about me. I tag all of you to do this little tag if you haven't done it yet and if you have done it please link it below and I'll pop over to your blogs and have a read.